When we observe the current trend on how education is preparing our youth, two directions reveal as obvious. Though a torrent of courses is being introduced every year, most of them have to do with digital skills and vague cross-industry domains. Our youth, so it seems, is becoming the jack of all trades and the master of none. Luckily, however, this trend started showing signs of reversal. Trade schools and vocational training universities have been struggling lately. People aged 20-25 build their careers in what seemed to be the unorthodox format just a decade ago. Joining digital startups, many are profoundly disconnected from manual work. Since woodworking classes disappeared from the curriculum altogether, prestigious UK furniture online design universities suffered a hit. They rely, mostly, on international students. But after signing up for courses that hardly lead to a job, young people began showing interest once again. The push, likely, is coming from parents who want their children to study things that will lead to a job. Running several scholarship programs, prestigious educational centers such as Buckinghamshire New University, and the faculty of art, architecture, and design at London Met, are trying to help young people acquire skills that are in high demand. Students graduate with an MA in furniture, but attend other trade classes as well, such as jewelry and textiles. They also get to learn about interior design, graphic design, product design, fashion, and illustration. Most of these skills rely on interdisciplinary study, where students become confident in both theory and the manufacturing process as well. They get to work on their own projects, learning the fundamentals through action, while taking advantage of the sophisticated workshop facilities these educational centers have to offer. 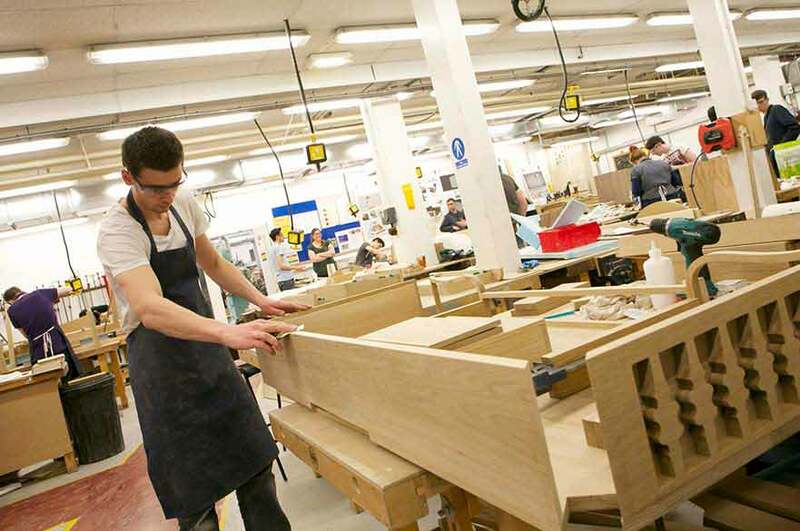 Unlike other college degrees where completion of the curriculum is expected before entering the job market, Furniture design universities encourage their students to build up their portfolio and become employable right away. Working with great tutors who are closely connected to the industry, they take full advantage of the mentorship process. Educators, however, are well versed in theory as well, teaching research methodology through product design and user experience. The goal is to be capable of materializing virtual models, but also design things that people are likely to use. Recent reports suggest that many students are coming back to trade universities, taking full advantage of this hands-on learning approach. With an array of classes, facilities, and tools at their disposal, they enjoy great autonomy. The market nowadays demands custom products and an ever-increasing array of diversification. This, in turn, creates opportunities rarely seen before. While we are not living in the “throw away economy” that Alvin Toffler has predicted 70 years back, the rate of change in consumerism habits accelerates at a rapid clip. Trends replace one another in what is an indefinite loop, and the turnaround is getting faster. This creates job opportunities for almost every product designer. Combined with the powerful tool that is the internet, connection, communication, and looking for prospects has never been easier. But another trend is at play as well. If you are familiar with the blue-collar renaissance, the future of trade work definitely looks bright. Trade universities have of recently been aided by the work of Mike Rowe. Host of the TV show “Dirty Jobs”, and a celebrity in his own right, it is in him that they found their most eloquent advocate. His foundation mikeroweWORKS is educating the youth, as well as parents, on the importance of trade work. Meaningful careers, according to him, can be found in the trades, leading to people being useful to society while making a very decent living. There is a shortage, as he is often telling people, of young men and women who are willing to get their hands dirty. This creates a skill gap that’s been growing over the past decade or so and is now bigger than ever. The opportunities for stepping in, if one is aware of them, are literally everywhere. Mike also talks about the societal and individual consequences of devaluing blue collar work. In his view, it can turn society profoundly disconnected from its needs. Luckily, according to him, the trend is about to see a reversal. The US, and now evidently the UK and the rest of Europe, are showing much more evident signs. Skilled work, it seems, is becoming increasingly popular. When there is a shortage of people willing to work with their hands, the market values them even more. I did a small survey prior to writing this article, and it led me to interviewing several people in Eastern Europe. When asked about textile and furniture work, many agreed on the fact that their workforce is immigrating elsewhere. “It is hard to find a good furniture designer nowadays. The skilled people who decided to stay are swamped with work, and you have to make a reservation several months prior” – said Meri Popova from Bulgaria. “Since our country entered the European Union, skilled tradesmen have been flying abroad. There is hardly anyone left. My brother and his family moved 2 years ago. He is a carpenter.” – said another man from Romania who wanted to remain anonymous. Reading these statements, the maxim writes itself – if the majority of people are leaving their homes to come and work in the UK and Western Europe, it must signal a significant shortage of skilled professionals.The future for trade universities and product design courses, therefore, looks very bright.Currently, there are over a dozen of universities offering quality furniture design education in the UK. Such include the De Montfort University, University of Wolverhampton, Sheffield Hallam University, Ulster University, York St john University, Birmingham City Universtiy, oxford Bookes University, and of course Buckinghamshire New University in High Wycombe. They offer BA degrees, and between 80-95% employment rates. Suffice to say, such a number is unusual regardless of the industry. Students can learn principles of three-dimensional design, manufacturing technology, and culture, visual communication, technical definition and have many hours of workshop practice, ultimately leading to a rich portfolio and numerous job prospects. Browse Furniture UK Online and keep up to date with what`s happening in the UK Furniture industry.